Rosacea is a skin condition characterized by redness on the face. Rosacea is a skin condition that is characterized by redness in the face, redness on the nose, inflammatory acne, growth of tissue around the nose area, and small pus filled bums. Patients commonly mistake this condition for an allergic reaction or common active acne. Although rosacea can affect patients of all backgrounds, the majority of affected patients are middle aged women with fair skin. Many patients report that consumption of alcohol or applying harsh skin products can make the symptoms worse. 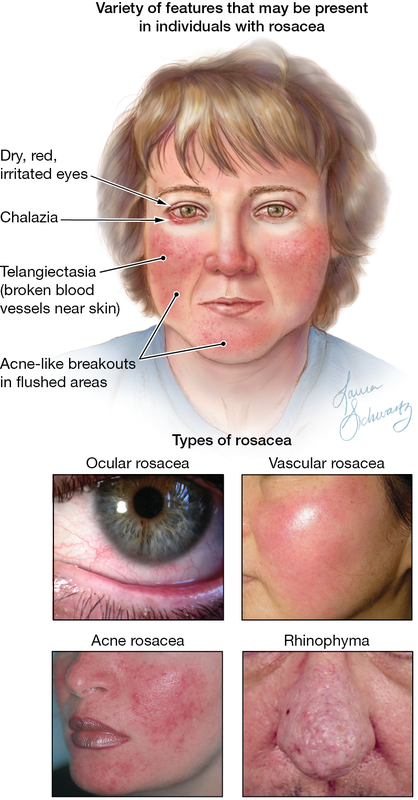 Although a common diagnosis, rosacea's cause still remains unknown. However, we do know certain factors that can cause a flare up or make the rosacea worse. These factors include hot drinks, spicy food, extreme temperature, exercise, emotions, cosmetics, and certain types of drugs. Rosacea requires constant and consistent treatments that may include prescription medications, change in lifestyle, change in eating habits, or laser treatments. If left untreated, rosacea may get progressively worse resulting in oil glands around the nose to become enlarged. This leads to growth of tissue which may require more invasive procedures to remove. How can lasers help with Rosacea? If you have rosacea, then we can use a combination of medications and laser treatments to control the flare ups and reduce redness. Although these treatment are effective, they will not permanently remove rosacea. At this time, there is no treatment to permanently remove rosacea.